The blue coned minarets and white domes of Topkapi Palace poked out above the lush green forest which separated Lagari’s team at Sarayburnu and the Sultan’s Palace. Abdullah his student lay struggling on the pier with his arm up the nozzle of rocket number six. Ahmed and Mustapha held the rocket steady as Chol the African slave looked on. Lagari stared at the busy foursome but the test flight five days ago preoccupied his mind. Lagari’s team had successfully launched a rocket pod with ballast mimicking human cargo; the seventeenth of its kind. But he questioned whether the testing had exposed all the flaws. Did he miss anything? They’d scheduled the eighteenth test flight for tomorrow but this time the rocket pod would contain human cargo and that human would be him! He stroked his beard and frowned in concentration. Abdullah pulled his arm out of the nozzle and said “all systems go!” He gave the thumbs up. Lagari stared at the cylindrical metallic object, feeling the trill of impending achievement. The rocket pod stood slightly taller than an adolescent boy, surrounded with seven small rockets and fueled with 140 pounds of gunpowder; a flying bomb. He took a deep breath and placed his hand on the cold metallic surface hoping the pod would reveal some hidden fault to justify cancelling the flight. He received nothing. They’d conducted extensive tests over the past several years and his instincts told him they were ready. Lagari pulled his hand away and turned to Chol who’d scrambled up. “No one is to touch this rocket pod until I arrive in the morning.” Bent with his gaze to the ground Chol nodded and stood waiting for his master to leave before sitting on his stool to keep vigil. Lagari along with Abdullah, Ahmed and Mustapha walked away for the night. The next day would be historic. The only question being, would he live to tell it? The shrieking cry of seagulls broke Lagari’s daze as he stood inside the rocket pod ready to launch. He stood tall with his head and shoulders exposed to the humid harbour air. The sun had passed its zenith and Lagari noted the good-sized crowd with umbrellas gathered at the dock in anticipation of the inaugural flight. Abdullah stood 20 feet away waiting for Lagari’s “go” to light the fuse. Beads of sweat rolled down Lagari’s face and settled over his lips. The air soaked with salt from the Bosporus gave it an extra briny taste. Lagari took a deep breath and let it out slowly. He closed his eyes and raised his index finger. Tense with determination he turned towards Abdullah and nodded, signaling the launch. A hush fell over the crowd as the spark snaked its way along the pier towards the rocket. Only the sound of sea gulls and the water lapping against the dock filled the air. The crowd stared, stunned into a trance. No one expected what would happen next. Rocket 3 ignited first with a hiss then a loud bang. The crowd jolted in unison, as if knocked out of a hypnosis. Toddlers started to cry and others backed away. The rocket tilted right, jolting Lagari to one side. But the launch pad kept the rocket pod in place and balanced. Rocket number 5, 2 and 1 ignited, followed by 4 and 7. Rocket number 6 fizzled out! Lagari stared at the failed rocket then looked at up at Abdullah who stared back with alarm – the same rocket he adjusted the previous night. Reverberations emanated from the launch pad like a herd of buffalos stampeding through a valley. Heavy smoke swirled around Lagari, blocking him and the pod from view. The crowd, terrified at the spectacle in front of them moved further back. Abdullah ignored the failed rocket like a veteran soldier unfazed by a fallen comrade and started the 10 second countdown. Lagari glanced away from the failed rocket without worry. He’d designed his flying machine with redundancy. He knew he could take off with just 6 rockets. The 7th rocket served as backup in case of failure. He just didn’t expect one to fail this early. The launch pad shook violently as the rocket screamed to be released. Experiments showed that he had to wait 10 seconds after ignition before the rockets would fire at full power. Only then could he lift off. Releasing too early meant the rocket would go into an unstable spin and crash. Rockets 1, 2, 3, 4, 5 & 7 fired at full power. The flame beneath the rockets erupted in a steady stream, like a hot blow torch. Abdullah pulled the chain attached to the clamps. The rocket screamed into the air leaving behind a plume of smoke, the rancid smell of burning gunpowder and the distant sound of a fast moving rocket. Lagari gripped the sides of the pod as it shot upwards. The city of Istanbul grew small at an alarming rate. Landmarks hidden just moments ago became visible. First the grayish blue façade of Suleymaniye Mosque then the curved contours of the Theodosian Walls. Lagari had difficulty enjoying his moment because he had not anticipated how the G-forces of rapid acceleration would punish his body. Disoriented, he felt light headed and clutched the pod edge. “The seventeen test flights did not reveal this caveat!” Lagari thought to himself as he struggled to compose himself. Fortunately, the rocket pod had only enough fuel for a 30 second burn and within minutes, the trip would be over. Rocket number 3 flamed out first, followed by the others in quick succession. The rocket slowed and the G-forces on him dissipated. Lagari gathered himself and prepared to eject; tucked his chute under his arm and readied himself to push away. The moment the speed had slowed enough, he jumped, spreading his arms and legs wide, and threw out his chute. It unraveled above him and caught him in a slow decent. 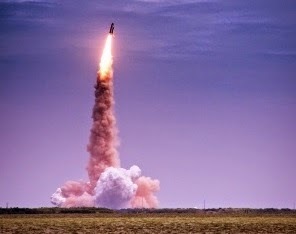 Heart pumping with the thrill of relief, he watched as the rocket did a slow roll and started its fall back to earth. It may have been a disorienting experience but he felt sorrow as the pod splashed into the Bosporus and sank. The pod that he designed and that carried him to glory had now fallen ignominiously into the sea without hope of recovery. He on the other hand would be greeted with a hero’s welcome. The pod deserved better. He thanked Allah and then the pod for its service. Lagari floated down to Earth. What took 30 seconds to go up would now take 60 seconds to come back down. He was shaken by the experience but he slowly became aware of his surroundings. He absorbed the incredible view of the city, the minarets defining the skyline, the Blue Mosque, the Hagia Sophia, Topkapi. It finally dawned on him; he’d accomplished something where few have succeeded; human flight. He belonged to a rare group of people who dared to defy gravity and live to tell it. He wondered if this was how Abbas ibn Firnas felt when he strapped himself to a glider and jumped off the cliffs of Jabal Al – ‘Arus on the outskirts of Qurtuba in Spain? He didn’t have time to ponder this question; the Bosporus rushed up to meet him and he splashed gently into the salty water. Back in familiar territory his mind turned to more pressing concerns; getting to shore. Lagari swam to shore, where he would present himself to the Sultan. As the first to have attempted flight using rockets, Lagari was rewarded with a pouch of gold and received a commission as a cavalry officer in the Ottoman army. He died in battle in the Crimea. It’s unfortunate that a mind such as Lagari would be wasted on the battlefields of Crimea instead of continuing his research; he would have been a valuable member of society. Lagari is not the first to have used rockets. The Chinese used firecrackers and simple rockets during their festivals but the first recorded use of rockets occurred in 1232 during the battle of Kai-Keng between the Chinese and the Mongols. These early rockets were used primarily to fire upon the enemy tipped with simple explosives or to propel a cannonball against a city’s defenses. Lagari was also not the first to achieve manned flight. Abbas ibn Firnas’ attempt in 875 is the first recorded instance of manned flight. Lagari’s legacy is that he was the first to introduce rocket power as a means of achieving manned flight. 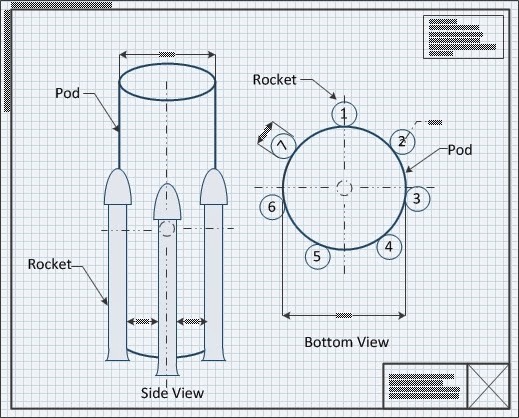 He and his team designed a metallic pod surrounded with 7 rockets using 140 pounds of gunpowder as rocket fuel. 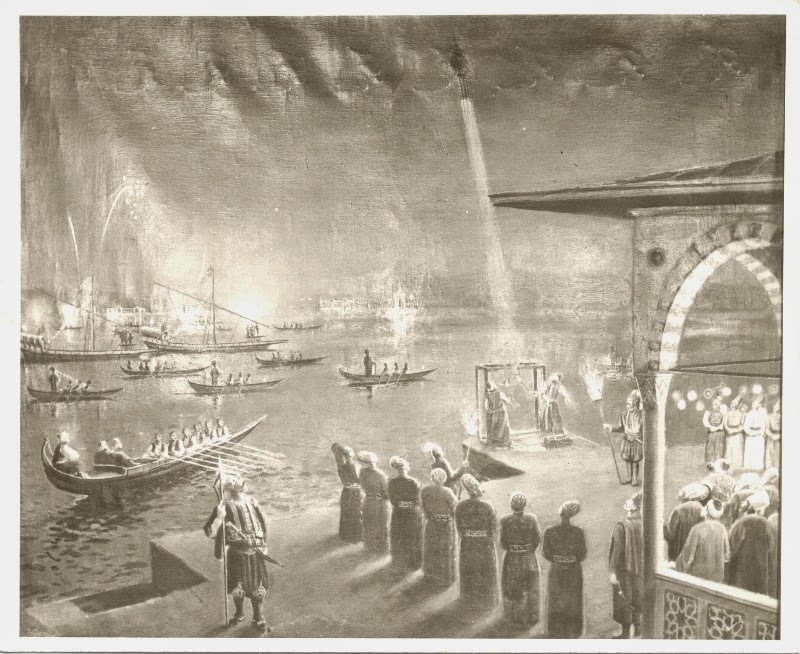 In 1633 on the docks of Sarayburnu (Istanbul) Lagari launched his rocket pod with himself inside marking history. The next attempt at a manned rocket would occur almost 300 years later in Germany. In 1928 Fritz von Opel designed a rocket car called the RAK1. It achieved a top speed of 75km/h with Fritz inside. Lagari reached the rocky shores of Istanbul. He pulled himself out of the water and flopped onto the seaweed covered rock. Breathing heavily, he looked up at the clear blue sky. His smoke trail had not yet cleared. He raised his arm and pointed where the smoke trail ended, marking the point where the rockets ran out of fuel. “I was just there 5 minutes ago and now I’m down here.” The thought sent a shiver down his spine. There is very little is written about this account and therefore I want to be separate the facts from the fiction. Lagari Hasan Celebi designed a 7 seven winged rocket. The flying machine used 140lbs or 300lbs of gunpowder as rocket fuel. The launch occurred in celebration of the birth of Sultan Murad IV’s daughter Kaya Sultan. Lagari launched his rocket of the docks of Sarayburnu with himself inside it and flew over the Bosporus. Once he reached the height of his ascent, he opened several “wings” (some interpret this to mean a parachute of some kind). Lagari landed gently in the water. Lagari was rewarded by the Sultan with some gold and a position in the military. He died in battle in the Crimea. Everything else in this post is from my imagination. how can you say those you labeled as fact as actual facts? the fact is, this entire episode is from a sole account written by traveller Evliya Çelebi. think about that for a second. only one written account of this 'incredible' story exist! it's not fact, it's science fiction!